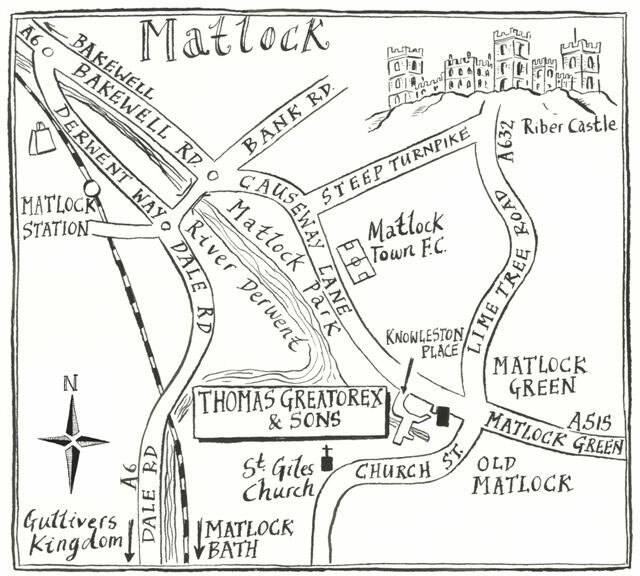 Thomas Greatorex & Sons Ltd of Matlock was founded in 1892. The original business was that of joiners, wheelwrights and blacksmiths, but as times changed and the horses and carts gave way to motor vehicles, the emphasis changed to joiners and undertakers. Thomas Greatorex started his business in Matlock in 1892 aged 34. He also married Mary the same year and they had nine children, three sons and six daughters. The original firm were joiners, wheelwrights and blacksmiths who made horse drawn carts, but as times changed and horses and carts gave way to motor vehicles the emphasis changed to joiners and undertakers. Two of the sons, Raymond and Roland joined the business. Thomas died on February 9th 1939 aged 81, his wife Mary, had predeceased him only three weeks earlier aged 73. With their father’s death Raymond and Roland became directors and the business became known as Thomas Greatorex & Sons Ltd.
Raymond continued the joinery part of the business and Roland assumed the main responsibility for dealing with funerals. Major development of the undertaking business took place in the 1950’s as a new chapel of rest and offices were opened at Matlock Green on our existing site. The Jepson family acquired the business in 1980 and Roger Jepson continues to lead the firm.